WordAds has been a hit with WordPress.com publishers and WordPress VIPs who further embraced it after we launched WordAds 2.0. Today we are excited to announce that WordAds is available to any WordPress site via the AdControl plugin. 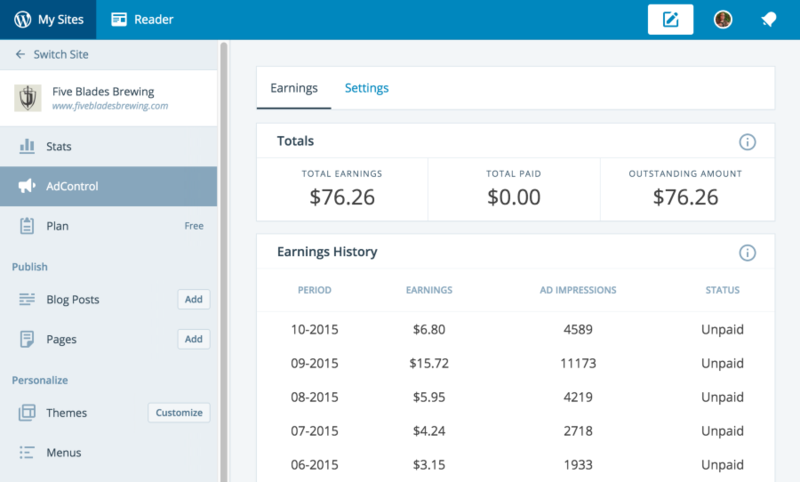 Built specifically for WordPress sites that want to earn income from advertising, WordAds is built for simplicity, allowing bloggers to focus on blogging and leave the monetization to your WordAds partner. Download and install the AdControl plugin here. Make sure that the Jetpack plugin is installed. More questions? Check the WordAds FAQ here. I have a wordpress.com site so this doesn’t apply to me, correct? Sorry to ask but I am curious Is there a minimum requirement to apply wordas especially traffic? There’s isn’t a simple threshold as sites’ earnings potential differ greatly depending upon which countries they see their traffic from. We hesitate to activate WordAds on sites that have too little traffic to have meaningful earnings. Hi Jon, I was running wordads nearly 3Y ago when I was part of wp.com. I am delighted to be running wordads again in my wp.org blog. The best thing about wordads is that is it not contextual and based on impressions. This suits my requirement well. Hope to see this program grow and evolve. Big thank you to all responsible. Hello, I am about porting my wordpress.com account to wordpress.org. The thing is I have a Wordads acct which is running. I have not yet gotten my MArch and April 2017 earnings, Would my switching to wordpressdotorg affect my ability to collect what is already owed to me, or would it affect my wordads account. Would my account keep running when I move? March earnings will be published by the end of the week; April earnings, however, won’t be published until the end of May as payments are sent around the last day of the following month. If you earned less than $100 in a given month, your earnings will carry over to the next month instead. You can stop using WordAds altogether. You’ll still be able to collect your earnings for your WordPress.com site as soon as they get posted. You can install the AdControl plugin on your site; you’ll then be able to apply for WordAds through that plugin, and once your site is approved the plugin will start displaying ads on your site like it used to do on your WordPress.com site. You can install the Jetpack plugin on your new self-hosted WordPress site. It comes with a lot of features you’ll be familiar with as a WordPress.com site owner. It’s free, and also includes Paid plans; if you purchase the Premium or Professional plan you’ll get access to Premium Security and backup services, and you’ll be able to use WordAds on your site without having to go through the approval process. I hope this clarifies things a bit. If you have more questions, don’t hesitate to get in touch!